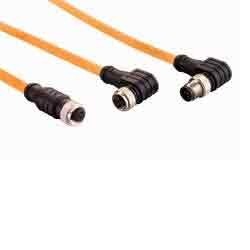 We offer Turck Industrial Identification such as RFID Cable (HF & UHF), Data Carriers / Read/ Write Heads HF, Data Carries / Read/Write Heads UHF and Interfaces HF & UHF from India. We are offering RFID Cable High Frequency Cable.We provide ready-made BL ident ® connection cables for safe communication between interface and read/write head.They are optimally adapted to the individual components and thus guarantee safe operation of the entire system.The standard cable ( /S2500) is perfectly suited for demanding applications.The Economy version ( S2503) convinces through a good price/performance ratio and is suited for demanding applications. TURCK also offers the adequate connection cable (FB-…) for harsh environments.Through combination with read/write heads of the Wash Down series, the high protection rating of IP69K is achieved. RFID solutions are thus employable in applications of the food industry.Ready-made bus and power supply cables from TURCK reduce the risk of wiring errors. For more information refer to "connection technology". We are offering Data Carriers. 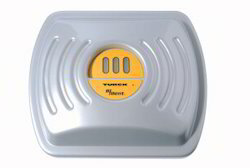 RFID systems with a radio transmission frequency of 13.56 MHz (HF) are almost insensitive to electromagnetic disturbance. This frequency band has become standard in many industrial RFID applications. Read/write heads and data carriers are interoperable and can be combined flexibly, thanks to the international radio transmission protocol ISO 15693. Transmission ranges of up to 50 cm are possible, depending on the combination of read/write head and data carrier. This enables you to operate manual as well as automated production processes (data carriers on guided paths) highly reliable. The data carriers are entirely maintenance-free, thanks to power supplied passively via the read/write head's electromagnetic field. The radio interface for read/write heads and data carriers meets international uniform standards, allowing all our HF-RFID products to be applied in any application worldwide. We offer a wide range of RFID Systems.RFID systems transmitting within a frequency band of 840 - 960 MHz (UHF), are characterized by high radio ranges and high-speed data transmission. This frequency band has become a standard for RFID applications requiring greater distances between read/write head and data carrier. The international radio transmission protocol ISO 18000-6 C, based on EPC global Class 1 Gen 2, guarantees moreover highest flexibility and investment security regarding the combination of read/write heads and data carriers. Transmission ranges of up to several meters are possible, depending on the combination of read/write head and data carrier. You will not only gain more operational reliability in automated processes but also achieve highest possible mobility in manually operated identification systems. The data carriers are entirely maintenance-free, thanks to power supplied passively via the read/write head's electromagnetic field. Another advantage of the UHF band is bulk reading. A process through which many data carriers are detected automatically and very fast by just one read/write head. This helps you to streamline your application processes with each identification event. We offer a wide range of Interfaces with High Frequency.Our interface modules are available with up to 16 channels and are protocol- capable as follows: PROFIBUS-DP, Device Net™, Ethernet /Mod bus TCP/IP, PROFINET I/O, CAN open and Ethernet/IP capable.Programmable gateways enable distributed and fast signal processing.Thanks to the modular concept, you can plug input and output modules to the interface at any time later on.All channels operate in parallel, allowing simultaneous transfer of data.Diagnostic information of field bus, power supply and channels is signaled via LEDs and completed by field bus-specific diagnostic messages. 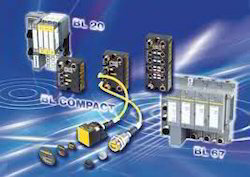 We offer standard function modules for easy integration in the control and fieldbus network.Alternatively, you can also use our BL ident ® simple modules BL202RFIDS for 8-byte communication. It helps you to reduce your programming effort significantly and to link BL ident® to all standard control systems without having to use function modules.If you need a simple and space saving RFID solution for your application, use the compact IP67 components from the BL compact series.